Dr. James F. Boynton discusses various brow lift techniques that can help patients surgically or nonsurgically achieve a rejuvenated upper facial appearance. Houston, TX — In both women and men, brow lifting can often be a great solution for treating various signs of aging in the forehead and upper facial area, states Houston plastic surgeon James F. Boynton, MD. He explains that some of the most common aesthetic concerns able to be diminished with this popular procedure include forehead wrinkles and creases, frown lines, sagging brow skin, deep horizontal folds, brow asymmetries, and more. Depending on the number and severity of these indications, he continues, patients may be good candidates for either a nonsurgical or surgical approach. According to the Houston plastic surgeon, “The ‘BOTOX® brow lift’ can often be an excellent option for men and women who do not need a surgical procedure to address their specific concerns.” With this in-office treatment, he explains that BOTOX® Cosmetic, XEOMIN®, or Dysport® injections can be administered to correct brow asymmetries as well as smooth lines and wrinkles on the forehead, typically with little to no downtime or discomfort. Results will vary by individual, he adds, but most people can expect the effects to last about three to four months before a “touch-up” treatment may be necessary. For those who might need more than a nonsurgical “BOTOX® brow lift” to achieve their goals, Dr. Boynton notes that the endoscopic brow lift, direct brow lift, and lateral subcutaneous brow lift are all potential surgical options. While each can be effective for the right patient, he states that he prefers to employ the lateral subcutaneous brow lift for a variety of reasons, including the technique’s ability to produce exceptional outcomes with a relatively quick recovery period. “As opposed to traditional methods that involve an incision extending from ear to ear along the hairline,” writes Dr. Boynton in a recent blog post, “this innovative technique utilizes tiny incisions that are hidden in the hairline on either side of the forehead.” As a result, he says he is able to successfully address the peak and arch of the brow while simultaneously removing loose, redundant skin on the forehead, ultimately creating a more youthful and exceptionally natural-looking appearance. As an added benefit, he notes that the procedure can generally be performed in-office with a local anesthetic, therefore eliminating the need for traditional hospital care or an overnight stay in an operating facility. 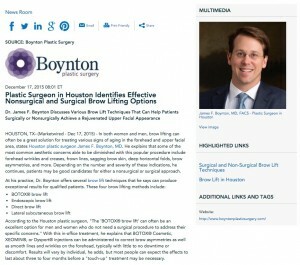 Ultimately, Dr. Boynton stresses that there is no “one-size-fits-all” approach to brow lifting, making it extremely important for prospective patients to consult with a board certified plastic surgeon who has experience with a number of different brow lift techniques. By doing so, he says the most appropriate option can be selected and performed based on the individual’s specific concerns and aesthetic desires. Dr. Boynton is a graduate of Duke University and the University of Texas Medical School at Houston. He is certified by the American Board of Plastic Surgery, and he is a Fellow of the American College of Surgeons. At his Houston-based practice, he offers an extensive range of surgical and nonsurgical procedures for the face, breasts, body, and skin. For each and every patient, Dr. Boynton is committed to delivering the highest quality of care in a safe and comfortable environment. He is available for interview upon request. To learn more, visit boyntonplasticsurgery.com, plus.google.com/116742002551605456947/about, and facebook.com/DrBoynton.